Oppressing the Masses is a record which really had its work cut out for it after such a frenzied, excellent debut, so it's a real testament to its quality that it managed to pull that off. I'm not insinuating that it is the measure of an Eternal Nightmare, but it's a well written and energetic follow-up that stays true to its 'brand', while marginally expanding the band's riffing horizons. Released through Atlantic Records, and with the black & white video support for "World in a World", which featured moshing and stage diving via some first person cameras, as well as vocalist Sean Killian looking intense alongside a swaying light bulb, one could argue that this effort was the apex of the band's visibility. Make it or break it. An album that would either increase the Californians' stock in the second tier of the US thrashing elite, or bury them among the rest of the rubble as the majority of the genre fell out of style in the 90s, obfuscated by grunge, nu metal, alt rock and the insurgence of greater extremity in metal itself. 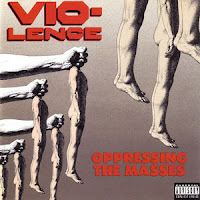 We all know now how it turned out for Vio-lence, they would never end up accruing the sort of promotion or following that could purchase them a private island in the Pacific, but if Masses isn't exactly top-shelf among sophomore albums like Ride the Lightning, Peace Sells or Hell Awaits, it's at least a worthwhile one which proved they were no fluke. Not yet, anyway. I had long harbored the memory that this was a very front-loaded record in terms of where its most memorable tracks lie, and I think that remained the case when revisiting it, with two of my favorite tracks ("I Profit" and "Officer Nice") heading it off, while only "World in a World" was on the latter half of the track list, but in truth this is quite a consistent 40-ish minutes of psychotic, pummeling thrash which doesn't have a lot of fat to trim, even if a few tunes like "Mentally Afflicted" or "Liquid Courage" get a little harder for me to recall when I'm not actively listening. The production here, both visual and auditory, reminds me a bit of another Bay Area thrash icon signed to Atlantic; Testament, in particular their third effort Practice What You Preach. Simple but effective cover image with a bunch of similar figures, a pronounced (and welcome) bass tone that popped right out of the mix, and a slightly comparable feel to the guitars. Of course, both of these albums were produced and recorded by Alex Perialas, also involved with Overkill's Under the Influence. which I would put in the same category due to the vocals and bass. Perialas definitely had a particular approach to thrash albums of this era which could draw out clarity and musicianship without sacrificing intensity, and while I myself prefer the guitars tones and energy of Eternal Nightmare, this definitely felt like a natural pairing which served to the strengths of its successor. Perry Strickland's drumming in particular seemed more ballistic here than on the debut, with some techniques in there that could nearly place him in the company of a Lombardo or Hoglan. 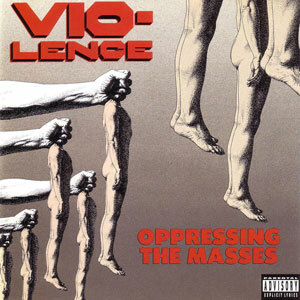 Crazy, muscular fills machine gunned all over the place, but never too invasive to the guitars, and some speed and footwork that left the impression that Vio-lence was well aware of the death metal emergence with which it would have to compete. Dean Dell's bass sounds great, bobbing and weaving a framework for the rhythms and leads, but remaining subdued when necessary. The actual riffs themselves compare favorably to the debut, perhaps not as catchy on an individual basis, but molded from a similar vision, getting a fraction more melodic, clinical and technical but not to the extent that this felt like a large progression from Eternal Nightmare. No, it's a natural follow-up with just enough ideas to encompass a two-year gulf in which the band was gigging and making a name for itself in a crowd of so many others. The leads are well implemented in an era where the bridge riffs were just as important, and they are. Killian's vocals here are not too reined in from the debut, still populating that higher, unhinged range and anger, still capable of a catchy verse line or chorus. Whether you were in the market for the faster, rabid sounding thrash or a set of mid-paced moshing riffs which would have also done Exodus or Sacred Reich proud, Oppressing the Masses was definitely one album that went into my teenage rotation and remained there for quite some time, for me the last valuable effort this band released. Not quite as concise or marvelous as its older sibling, but an album I can still spin today to generate the same level of excitement for a period in which one of my favorite genres was heavily saturated with great material on a normal basis. Coincidentally, it is also the last genuinely good album Robb Flynn has ever been a part of. Almost 30 years, dude, maybe step it up a little.